On 22 April 1951, Jack Kerouac finished typing the first draft of On the Road, the novel that would eventually be published in 1957 and distil the generation that Kerouac himself had already defined as “beat”. On The Road is a story of Kerouac’s true-life friendship with Neal Cassady and their four trips across the United States; it is one of the most important American novels of the twentieth century, despite the fact that its has its critics. Truman Capote dismissed it as “typing, not writing”. Kerouac did not type the draft on ordinary sheets of paper, but on a scroll. Before sitting down to type, Kerouac made the scroll by cutting 20-inch-wide lengths of tracing paper into narrower 9-inch strips that fitted into his typewriter. He then pasted them together into 12-foot-long reels of paper so that once he had started, he did not have to stop, just type. The spontaneous outburst of creativity and unrevised rhythm was fuelled only, Kerouac said, by coffee. Kerouac typed fast. He said he “went fast because the road is fast“. 100-plus words a minute. He finished the draft in 20 days. On the first day he typed 12,000 words, and, on the last, 15,000. In the published novel, there are paragraph breaks. In the scroll, there are none. The writer could not stop to press the key, would not risk slowing his breathless prose. The scroll contains the real names of the author’s friends, not the names used later in the published book; Cassady became Dean Moriarty, the poet Allen Ginsberg is Carlo Marx, and Kerouac himself was reborn as Sal Paradise. The scroll is almost 120 feet long. It looks like a road and a journey in itself. However, the end of the scroll, containing Kerouac’s original ending, is missing. At the current end is a handwritten note from Kerouac that says: “DOG ATE [Potchky-a dog]”. Potchky was a cocker spaniel owned by Kerouac’s friend Lucien Carr. Nobody knows how much longer the scroll was before Potchky sank his teeth into it. 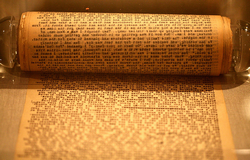 The scroll, now a little brittle round the edges, was sold at Christie’s in May 2001, fifty years after it was typed. The seller was the nephew of Kerouac’s third wife, Stella, to pay inheritance taxes. The buyer, James Irsay, the owner of the Indianapolis Colts, paid $2.43m for one of the most iconic, but partially lost, manuscripts of the twentieth century. * Photo used courtesy of a creative commons licence from Thomas Hawk. This entry was posted in Eaten manuscripts and tagged Kerouac, On The Road, Potchky on 14 August, 2012 by Horatia.